Global warming alarmism first emerged in the late 1980s, three decades ago. Put very simply, the claim is that climate change, resulting from human-caused increases in trace gases, is a BIG potential problem. The BIG solution is to control reduce global greenhouse gas emissions through a co-ordinated global action. The actual evidence shows a curious symmetry. The proponents of alarmism have failed to show that rises in greenhouse gas levels are making non-trivial difference on a global scale, and the aggregate impact of the policy proposals on global emissions, if fully implemented, will make a trivial difference to global emissions pathways. The Adoption of the Paris Agreement communique paragraph 17 clearly states the failure. My previous post puts forward reasons why the impact of mitigation policies will remain trivial. In terms of an emerging large problem, the easiest to visualize, and the most direct impact from rising average temperatures is rising sea levels. Rising temperatures will lead to sea level rise principally through meltwater from the polar ice-caps and thermal expansion of the oceans. Given that sea levels have been rising since the last ice age, if a BIG climate problem is emerging then it should be detectable in accelerating sea level rise. If the alarmism is credible, then after 30 years of failure to implement the BIG solution, the unrelenting increases in global emissions and the accelerating rise in CO2 levels for decades, then there should be a clear response in terms of acceleration in the rate of sea level rise. The bottom line is that, even if (1) we assume the Church & White tide gauge data are correct, and (2) 100% of the recent acceleration is due to humans, it leads to only 0.3 inches per decade that is our fault, a total of 2 inches since 1950. In metric, the so-called human element of 2 inches since 1950 is 5 centimetres. The total in over 60 years is less than 15 centimetres. The time period for improving sea defences to cope with this is way beyond normal human planning horizons. Go to any coastal strip with sea defences, such as the dykes protecting much of the Netherlands, with a measure and imagine increasing those defences by 15 centimetres. However, a far more thorough piece is from Dave Burton (of Sealevel.info) in three comments. Below is his a repost of his comments. Agreed. On Twitter, or when sloppy and in a hurry, I say “no acceleration.” That’s shorthand for, “There’s been no significant, sustained acceleration in the rate of sea-level rise, over the last nine or more decades, detectable in the measurement data from any of the longest, highest-quality, coastal sea-level records.” Which is right. That is true at every site with a very long, high-quality measurement record. If you do a quadratic regression over the MSL data, depending on the exact date interval you analyze, you may find either a slight acceleration or deceleration, but unless you choose a starting date prior to the late 1920s, you’ll find no practically-significant difference from perfect linearity. In fact, for the great majority of cases, the acceleration or deceleration doesn’t even manage statistical significance. What do I mean by “practically-significant,” you might wonder? I mean that, if the acceleration or deceleration continued for a century, it wouldn’t affect sea-level by more than a few inches. That means it’s likely dwarfed by common coastal processes like vertical land motion, sedimentation, and erosion, so it is of no practical significance. As you can see, there have been many five-year to ten-year “sloshes-up” and “sloshes-down,” but there’s been no sustained acceleration, and no apparent effect from rising CO2 levels. The linear trend is +1.482 ±0.212 mm/year (which is perfectly typical). Quadratic regression calculates an acceleration of -0.00539 ±0.01450 mm/yr². The minus sign means deceleration, but it is nowhere near statistically significant. To calculate the effect of a century of sustained acceleration on sea-level, you divide the acceleration by two, and multiply it by the number of years squared, 100² = 10,000. In this case, -0.00539/2 × 10,000 = -27 mm (about one inch). That illustrates a rule-of-thumb that’s worth memorizing: if you see claimed sea-level acceleration or deceleration numbers on the order of 0.01 mm/yr² or less, you can stop calculating and immediately pronounce it practically insignificant, regardless of whether it is statistically significant. However, the calculation above actually understates the effect of projecting the quadratic curve out another 100 years, compared to a linear projection, because the starting rate of SLR is wrong. On the quadratic curve, the point of “average” (linear) trend is the midpoint, not the endpoint. So to see the difference at 100 years out, between the linear and quadratic projections, we should calculate from that mid-date, rather than the current date. In this case, that adds 56.6 years, so we should multiply half the acceleration by 156.6² = 24,524. -0.00539/2 × 24,524 = -66 mm = -2.6 inches (still of no practical significance). So, applying the rule-of-thumb above, the first thing you should notice is that 0.008 mm/yr² of acceleration, even if correct, is practically insignificant. It is so tiny that it just plain doesn’t matter. In 2009 they posted on their web site a new set of averaged sea-level data, from a different set of tide gauges. But they published no paper about it, and I wondered why not. So I duplicated their 2006 paper’s analysis, using their new data, and not only did it, too, show slight deceleration after 1925, all the 20th century acceleration had gone away, too. Even for the full 20th century their data showed a slight (statistically insignificant) deceleration. 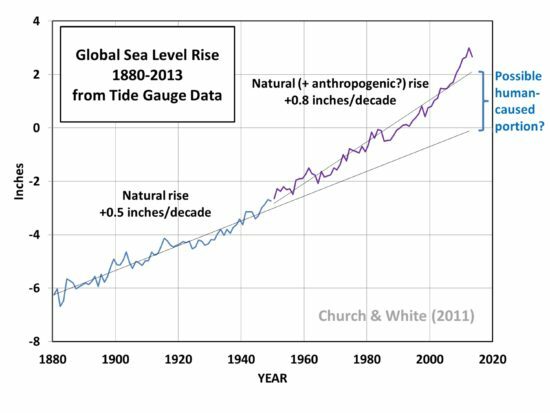 Church and White (2009), Never mind: no 20th century acceleration in global sea-level rise, after all. There is no real disagreement between the too accounts. Roy Spencer is saying that if the Church and White paper is correct there is trivial acceleration, Dave Burton is making a more general point about there being no statistically significant acceleration or deceleration in any data set. At Key West in low-lying Florida, the pattern of near constant of sea level rise over the past century is similar to Honolulu. The rate of rise is about 50% more at 9 inches per century but more in line with the long-term global average from tide gauges. Given that Hawaii is a growing volcanic island, this should not come as a surprise. I choose Key West from Florida, as supposedly from projecting from this real data, and climate models, the Miami-Dade Sea Level Rise Task Force produced the following Unified Sea Level Rise Projection. The projections of significant acceleration in the rate of sea level rise are at odds with the historical data, but should be discernible as the projection includes over two decades of actual data. Further, as the IPCC AR5 RCP8.5 scenario is the projection without climate mitigation policy, the implied assumption for this report for adapting to a type of climate change is that climate mitigation policies will be completely useless. As this graphic is central to the report, it would appear it is the usage of the most biased projections that appears to be influencing public policy. Basic validation of theory against modelled trends in the peer-reviewed literature (Dr Roy Spencer) or against actual measured data (Dave Burton) appears to be rejected in favour of beliefs in the mainstream climate consensus. The curious symmetry of climate alarmism between evidence for BIG potential climate problem and the lack of an agreed BIG mitigation policy solution is evident is sea level rise projections. Unfortunately, given that policy is based on the ridiculous projections, it is people outside of the consensus that will suffer. Expensive and unnecessary flood defences will be built and low-lying areas will be blighted by alarmist reports. Over at Cliscep, Jaime Jessop has rather jokingly raised a central claim of the IPCC Fifth Assessment Report, after someone on Twitter had accused her of not being a real person. So here’s the deal: Michael Tobis convinces me, on here, that the IPCC attribution statement is scientifically sound and it is beyond reasonable doubt that more than half of the warming post 1950 is indeed caused by emissions, and I will post a photo verifying my actual existence as a real person. Attribution results are typically expressed in terms of conventional ‘frequentist’ confidence intervals or results of hypothesis tests: when it is reported that the response to anthropogenic GHG increase is very likely greater than half the total observed warming, it means that the null hypothesis that the GHG-induced warming is less than half the total can be rejected with the data available at the 10% significance level. Overall conclusions can only be as robust as the least certain link in the multi-step procedure. There are a number of candidates for “least certain link” in terms of empirical estimates. In general, if the estimates are made with reference to the other estimates, or biased by theory/beliefs, then the statistical test is invalidated. This includes the surface temperature data. Further, if the models have been optimised to fit the surface temperature data, then the >50% is an absolute maximum, whilst the real figure, based on perfect information, is likely to be less than that. Most of all are the possibilities of unknown unknowns. For, instance, the suggestion that non-human causes could explain pretty much all the post-1950 warming can be inferred from some paleoclimate studies. This reconstruction Greenland ice core (graphic climate4you) shows warming around as great, or greater, than the current warming in the distant past. The timing of a warm cycle is not too far out either. In the context of Jaime’s challenge, there is more than reasonable doubt in the IPCC attribution statement, even if a statistical confidence of 90% (GHG emissions) or 95% (all human causes) were acceptable as persuasive evidence. There is a further problem with the statement. Human greenhouse gas emissions are meant to account for all the current warming, not just over 50%. If the full impact of a doubling is CO2 is eventually 3C of warming, then from that the 1960-2010 CO2 rise from 317ppm to 390ppm alone will eventually be 0.9C of warming. Possibly 1.2C of warming from all sources. This graphic from AR5 WG1 Ch10 shows the issues. The orange line of anthropogenic forcing accounts for nearly 100% of all the measured warming post-1960 of around 0.8C – shown by the large dots. Yet this is about 60% of the warming in from GHG rises if a doubling of CO2 will produce 3C of warming. The issue is with the cluster of dots at the right of the graph, representing the pause, or slow down in warming around the turn of the century. I have produced a couple of charts that illustrate the problem. In the first graph, the long term impact on temperatures of the CO2 rise from 2003-2012 is 2.5 times that from 1953-1962. Similarly, from the second graph, the long term impact on temperatures of the CO2 rise from 2000-2009 is 2.6 times that from 1950-1959. It is a darn funny lagged response if the rate of temperature rise can significantly slow down when the alleged dominant element causing them to rise accelerates. It could be explained by rising GHG emissions being a minor element in temperature rise, with natural factors both causing some of the warming in the 1976-1998 period, then reversing, causing cooling, in the last few years.